Not only that, but those stamped numbers would had to have had successive coding for versions of the same shifter series. Pete Serio told me of at least 3-4 changes in the 69 model year alone due to all the change orders GM sent to Hurst regarding the column lock and the changes that brought throughout the year. I would bet one of those characters in the stamp is the series for revisions. I'd guess it was the first because of the 1/2/3 but then why the 6 or 8's later in the year? Or are there actually other prefixes such as 4/5/6/7 that we simply haven't seen yet. Here's one from another 69 that starts with a 3. So much is still unknown about shifter coding, dates and batch codes or series? It's fantastic to have CRG and its members compiling data such as this, but there's a lot more remaining to be learned before attempting to pull an actual date from this code, or how it can actually be deciphered. GreenNV: The one you show fits perfectly with the encoding we've determined (from original '69 cars/shifters). The first (one or two digits) is the MONTH, the 2nd (or third) digit is the YEAR. The one you show is for March of 1969... the following characters/digits are perfectly able to account for 'versions' or 'batches' that seemingly only Hurst knows about at this point in time..
Generally, at this point, we are looking at codes from 69 Camaro Hurst shifters. I am pretty sure coding changed for 70 and later. Let's try to not muddy the water too much. Let's stick with original Hurst shifters from original 69 Camaros. I think you're right Gary. If you look at the first 3 codes on mine (128) December 1968 is the only thing that makes sense. So I believe looking at the shifter posted just above, I agree that would likely be a March 1969 shifter. Bryon, I have another factory Camaro Hurst that has an original 70 Camaro stick in it. I believe that shifter body is dated very late in the 69 calendar year. Might have a slightly different sequence of numbers if I remember right. I'll leave that out of the conversation for now. But if it becomes crucial to determining any information on numbers/letters and how they might of changed, I'll dig it back out. You can dig it out and post if you want. At the beginning I had posted a couple of Pontiac shifter codes. 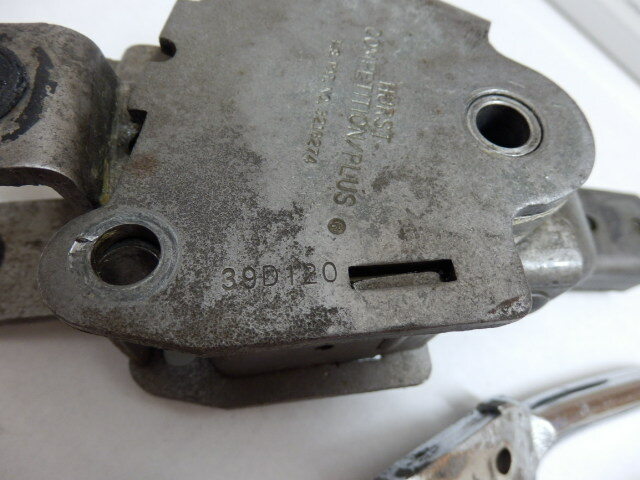 Other GM divisions were using Hurst shifters several years before Chevrolet. I just don't want us to lose focus. No we don't understand everything, but I feel we are on the right track with the date codes used for 69 Camaro Hurst shifters. Agreed. Why there other formats in non-69 Camaro shifters is not part of this discussion. Showing some examples from other known original shifters is fine, e.g. here is a 68 F-bird 03C shifter. Another 69 shifter. This is a restored one I picked up for my 69 build and will be going into my 05A car. I'll need to find some original bolts for this one before mounting it up. If possible, I would like to see any additional posts be from original cars with original shifters. You can delete that post then. It's one number off the original from my car and thought the more you can learn about dates the better, but I guess this thread is only for original "born with" shifters for the 69 model year only then? Well since this is a First Generation Camaro website, and the only Hurst shifters that we are doing research on are from 69 Camaros, yes. That's what we have determined in this thread that we are concentrating on, and we are trying to figure out the stamping codes. Unknown shifters don't help much. My earlier post was a REQUEST, not a demand.